U.S. Trade Representative Robert Lighthizer, a Trump nominee who knows what he’s doing. In praise of United States Trade Representative Robert Lighthizer. 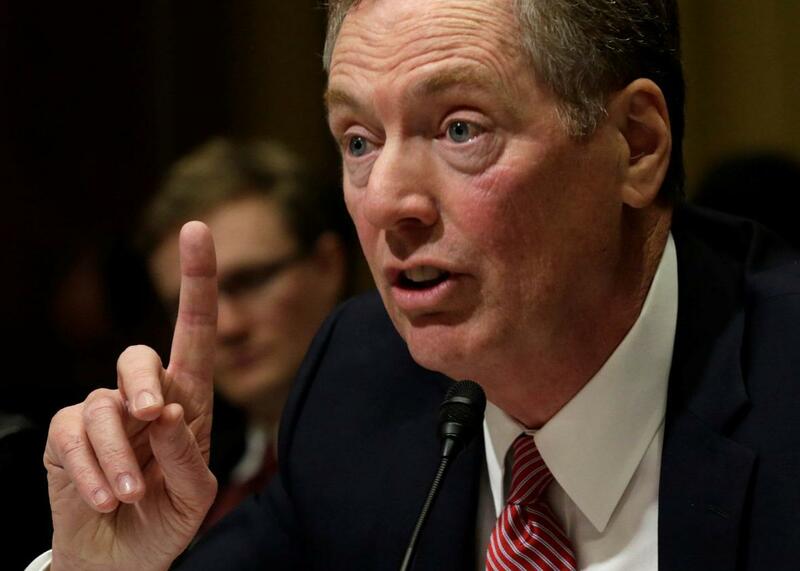 Robert Lighthizer testifies before a Senate Finance Committee confirmation hearing on his nomination to be U.S. trade representative on March 14. After weeks of waiting, and when just about everyone was focused on President Trump’s amazingly impetuous decision to fire James Comey, the Senate confirmed Robert Lighthizer as the new United States trade representative. There’s something more than a little poignant about the fact that Lighthizer’s confirmation late last week— by a margin of 82 votes to 14, which is not bad in such a polarized moment—was overshadowed by yet another Trump meltdown. That’s because if Republicans had embraced Lighthizer’s thinking years ago, there never would have been a Trump presidency. That’s a strong statement, I’ll admit. But I believe that if someone like Lighthizer had been leading trade policy under George W. Bush, the United States might have taken corrective action to mitigate the decline of the U.S. manufacturing sector. This in turn might have dampened the shift of voters in trade-exposed regions to candidates further to the right or the left, a phenomenon that arguably paved the way for the rise of a hyper-polarizing figure like Trump. If Republicans had been quicker to embrace Lighthizer’s brand of economic nationalism during the Obama years, the GOP electorate might have proved more resistant to Trump’s appeal. For years, Lighthizer has been a lonely Republican critic of free trade. Is he right about everything? Of course not. But long before it became a near-consensus view, he warned that opening trade with China too quickly would have baleful consequences for the U.S. manufacturing sector. * Lighthizer’s views are informed in part by the fact that he’s worked on behalf of U.S. companies facing foreign competition. To the most ideologically committed free traders, the Lighthizers of the world are easy to dismiss: These are the crony capitalists (to be polite) and parasites (to be less so) who prey on U.S. consumers to serve their corporate paymasters, and who use the rhetoric of economic patriotism as a fig leaf for what is essentially self-dealing behavior. It was fitting that Lighthizer wrote his op-ed in the waning days of the George W. Bush administration. Though it was Bill Clinton who presided over the decision to grant China permanent normal trade relations in 1999, an essential prerequisite to China joining the World Trade Organization in 2000, it was Bush who was president when the effects of PNTR took hold. This gave the Bush White House an opportunity. One way to think of these safeguards is as a way to help ensure that U.S. industries facing import competition would be given some breathing room to adapt to the new dispensation. Making use of these safeguards might have given the Bush administration leverage it could have used to press the Chinese government to truly open its own market to U.S. goods and services. Instead, the Bush White House barely used the safeguards provision at all. In a 2010 report to the U.S.–China Economic and Security Review Commission, Lighthizer noted that after 2005, U.S. firms gave up on seeking safeguard measures from the Bush administration entirely, so sure were they that their requests would be ignored. In that same testimony, Lighthizer detailed the optimistic assumptions that were made about the impact that granting China permanent normal trade relations would have on the U.S. economy, among them that U.S. manufacturers would thrive by exporting to the Chinese market. In reality, the U.S. manufacturing sector got hammered. Economists Justin Pierce and Peter Schott have found, for instance, that by ensuring U.S. tariffs on Chinese-manufactured goods would remain low, PNTR set off a wave of offshoring that contributed to what Pierce and Schott call the “surprisingly swift decline of U.S. manufacturing employment.” Moreover, U.S. exporters barely made a dent in the Chinese market, a development Lighthizer attributed to China’s unauthorized use of export restrictions, lax or nonexistent enforcement of intellectual property protections, and unsubtle pressure on the part of the Chinese government to get non-Chinese firms to transfer their technology to Chinese firms. Why did the Bush administration do so little to fight back against Chinese mercantilism? Part of the reason, as Setser points out, is that “the interests of U.S. firms and U.S. workers were not always aligned.” Once PNTR ensured U.S. tariffs would always be low, U.S. multinationals were quite happy to use Chinese production to meet U.S. and global demand, even if it meant they’d slowly lose the capacity to build much of anything at home—and even if it meant that Chinese firms backed formally and informally by the Chinese state would soon emerge as formidable competitors. Bush-era Republicans believed that the housing boom and the growth of financial services would be enough to ensure prosperity in a post-manufacturing America. Suffice it to say, that strategy didn’t turn out terribly well. To Lighthizer, the goal of trade policy should be to foster a flourishing middle class, to retain the capacity to innovate, and to achieve high and rising productivity levels. Achieving these goals might entail lowering trade barriers in some instances while raising them in others. It will require other adjustments beyond trade policy, including labor market and regulatory reform, to foster employment growth in emerging industries. But the basic idea is straightforward: Government has a legitimate role to play in ensuring that U.S. trade policy serves the long-term interests of U.S. workers. George W. Bush rejected this perspective as president. While Reagan tempered his commitment to free trade and free markets with a willingness to intervene on behalf of domestic industries facing extinction, Bush essentially chose to accept the hollowing out of the U.S. manufacturing sector as inevitable. It’s hard not to wonder what might have been if Lighthizer had been confirmed as USTR in 2001, not 2017. What might Lighthizer accomplish under Trump? There’s been a lot of talk about the new U.S. trade representative leading a renegotiation of NAFTA, though it’s not entirely clear what that will mean in practice. In his confirmation hearings, he also pledged to do everything he can under the rules of the World Trade Organization to combat trade violations—a clear nod to his belief that China is a serial rule-breaker. But the China shock has already come, and the manufacturing jobs that were lost in the Bush years aren’t coming back. One thing we can safely say is that, unlike many of Trump’s other appointees, Lighthizer is a man who knows exactly what he’s doing. I just hope it’s not too late for him to do some good.